Yee-haw cowboy. 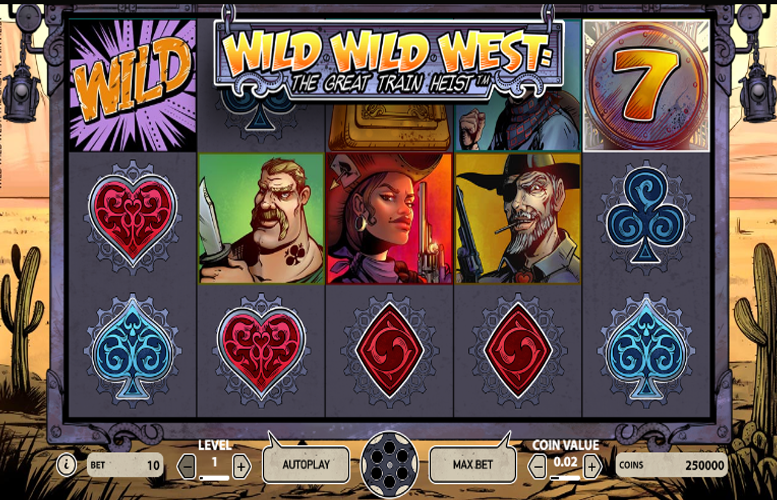 Why not take a trip out to the old west on the Wild Wild West: The Great Train Heist slot machine by NetEnt? If stylish looking machines will lots of atmosphere are your thing, you’re in the right place. This one has a real character to it. In terms of specifics, the Wild Wild West: The Great Train Heist machine is played over a standard video slot set of reels. This means there are five reels and three rows of symbols. When it comes to prizes, these are awarded for matching symbols along one of the 10 fixed win lines. The game features two standard bonus features that are commonplace on many different slot machines. These are a Pick and Click feature and a Free Spin mode. 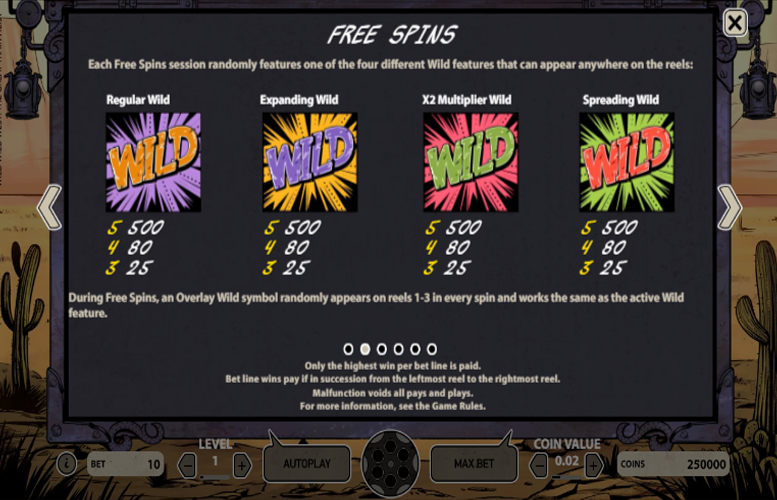 However, during the Free Spin game, the “wild” symbol has a different impact on the game. More on that later though. Great art style and animation. The designers of this slot really worked hard to create a stylised game with a lot of character. Fantastic music sets the tone of the game. You could be moseying on down to the local saloon for real to this very soundtrack! Limited creativity in terms of bonus features. They’re potentially lucrative but with just a variety of Free Spins modes and a Pick and Click feature to keep players entertained, the longevity of gameplay on the Wild Wild West machine might be lower than you’re used to. 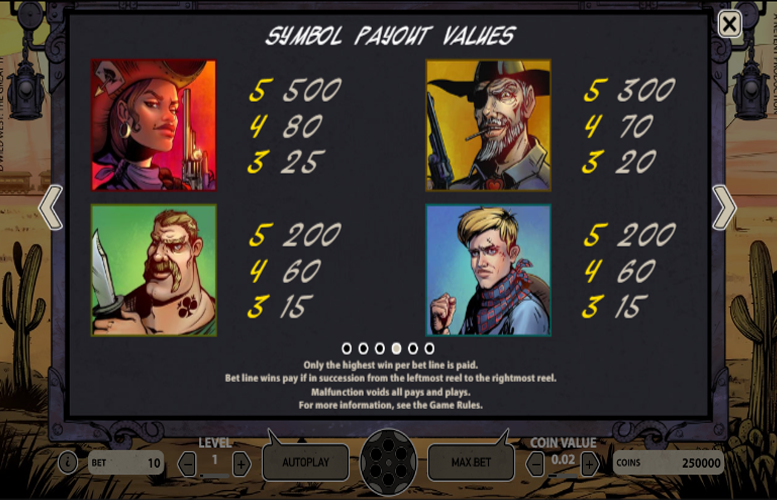 In the Wild Wild West: The Great Train Heist slot machine, the top jackpots are awarded for hitting five-of-a-kind of the higher value symbols. Except the regular “wild” symbol, the other larger paying symbols are represented by the bandits responsible for the train heist referred to in the slot’s title. Regular “Wild” = 500x the line bet. Bandit with red background = 500x the line bet. Bandit with yellow background = 300x the line bet. Bandit with green background = 200x the line bet. Bandit with blue background = 200x the line bet. 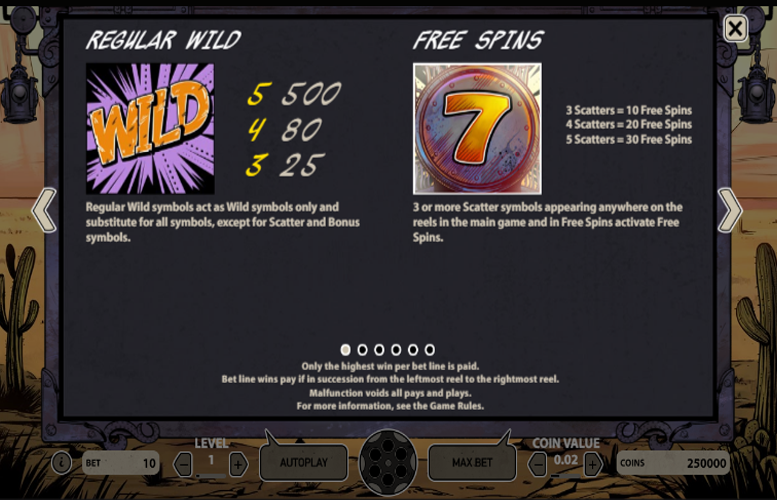 Landing three or more Lucky Seven “Scatter” symbols anywhere on the reels will activate a more than generous Free Spin mode. There’re a massive 30 free spins up for grabs here too! Four “Scatters” = 20 Free Spins. Five “Scatters” = 30 Free Spins. Orange on purple = regular “wild”. Purple on orange = expanding “wild”. Green on pink x2 = multiplier “wild”. Pink on green = spreading “wild”. 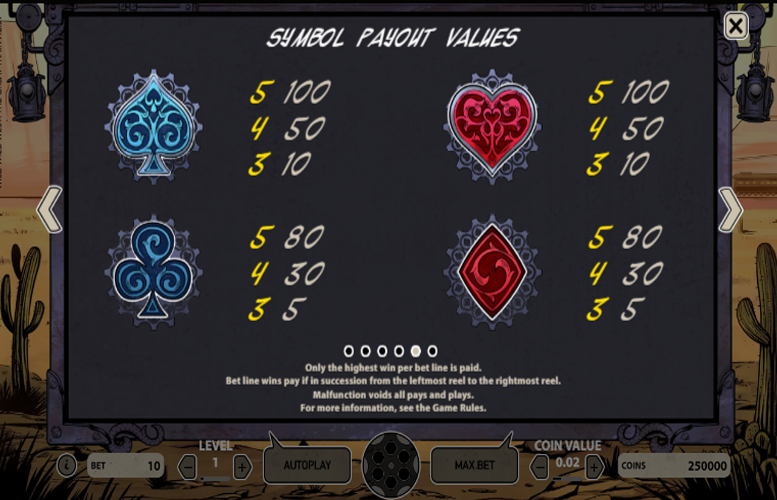 Players who land three “Bonus” symbols anywhere on the reels one three, and five simultaneously will activate the Pick and Click feature. This feature is reserved for the main game only. The player must click on one of the “Bonus” symbols to reveal an instant cash prize. Only one prize is rewarded per Pick and Click Feature. The prize won will be between 5x and 50x the total bet. Spade or heart = 100x the line bet. Club or diamond =80x the line bet. The number of win lines are fixed at just 10 on the Wild Wild West: The Great Train Heist slot machine. This means that players are only able to adjust the number of coins bet per line, as well as the value of each of these coins. The maximum and minimum coin values are £1 and 1p respectively. Meanwhile, as few as one and as many as 10 coins can be bet on each of the win lines. Therefore, the lowest possible bet per spin is 10p and the highest is £100. This upper limit should just about satisfy high rollers. That said, those who like to play pure “nose-bleed” stakes will likely find it a little limiting. All told, the Wild Wild West: The Great Train Heist slot machine is a solid offering from NetEnt. Whereas the gameplay isn’t going to win any awards for creativity, the art style might. That’s where this slot really shines – the visuals. If this is going to be enough to keep you coming back for more wild west action is up to you!